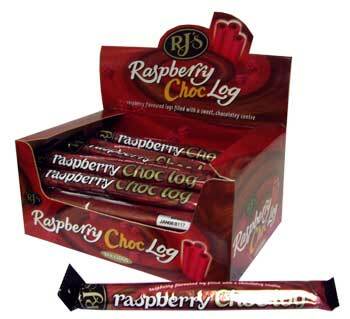 Belgium style chocolate filling wrapped in RJ’s famous raspberry licorice. RJ’s scours the world to find the finest ingredients to make their licorice have the most delicate taste and texture. Raspberry Log: , Wheat Flour, Cane Sugar, Glucose Syrup, Water, Humectant (E422), Rice Bran Oil, Flavouring, Acidity Regulators (E296, E330), Salt, Natural Colour, Liquorice Extract. Centre Filling: Cane Sugar, Palm Oil, Whey Powder, Skim Milk Powder, Cocoa Powder, Emulsifier (Soy Lecithin), Vanillin. 4% Cocoa Solids, 23% Milk Solids.